Error plots show how well the complexity of a mesh matches the complexity of the model and its loads. 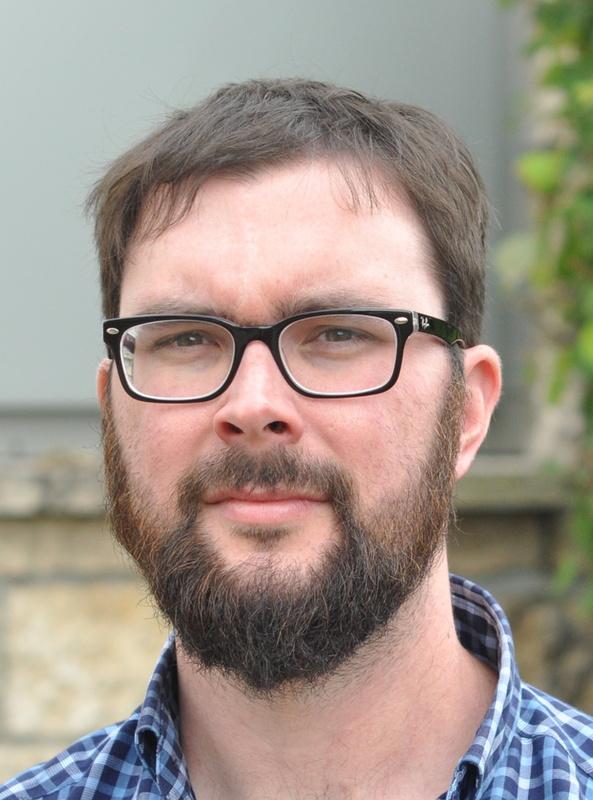 Once the mesh matches the complexity of the model, the reported error is low. We use 5% error as an acceptance criterion. This method checks the whole model at once, and is much less work than mesh refinement. 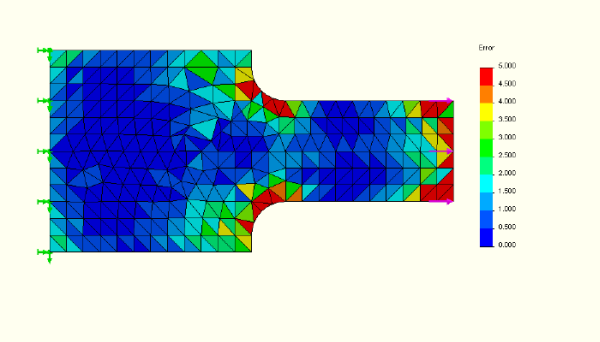 This study compares mesh refinement at a node with error plot methods to estimate the convergence of FEA results. 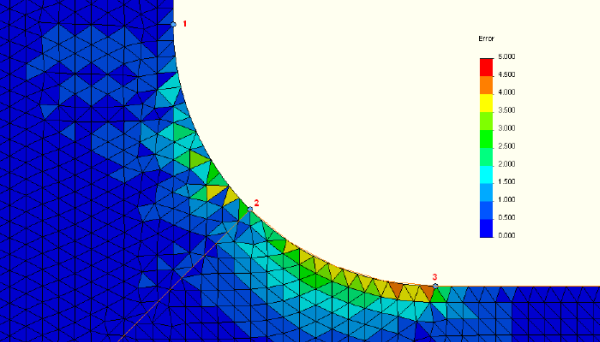 CosmosDesigner (Now SolidWorks Simulation) 2008 SP5.0 FEA software is used for this report. 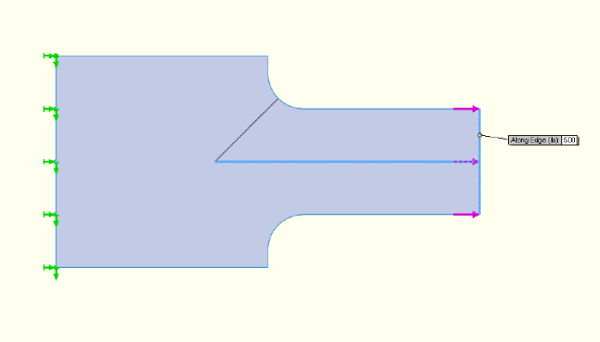 Test shape – a simple flat plate modeled at 1/4″ thickness. 3 test points (1, 2, 3) are shown on this model. 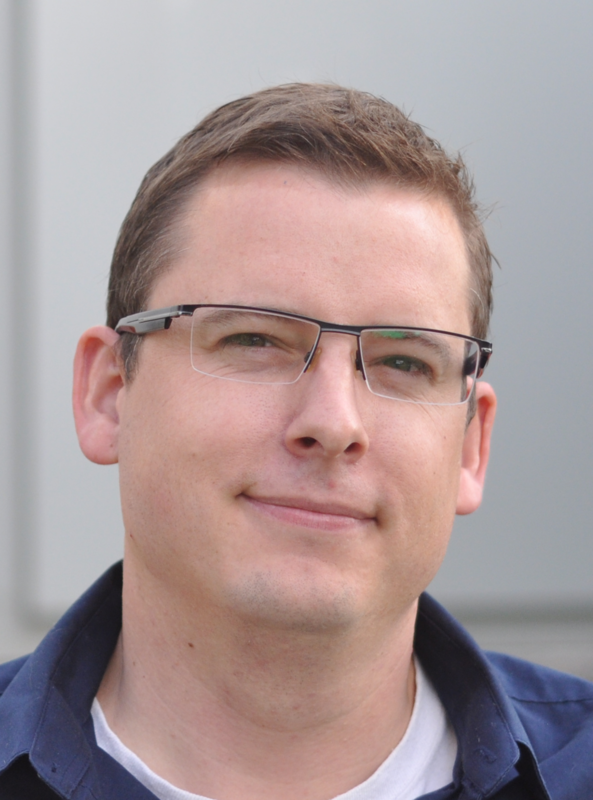 A split line has been added to guarantee a node will always be available at point 2 to sample. For this sample, the stress at the three points is of interest, so the error at those points has to be less than 5% per the acceptance criteria. Applied loads – 2 x 500 psi at the left edge. The right edge is fixed. The shell model is meshed at 1/4″ thick. 1″ mesh size. The reported error in the area of interest is greater than 5%. The results can not be used. 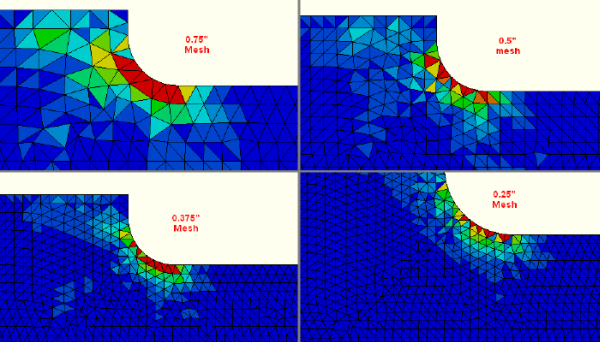 1/8″ mesh size – coarsest mesh to produce an acceptable error plot for the 3 areas of interest. 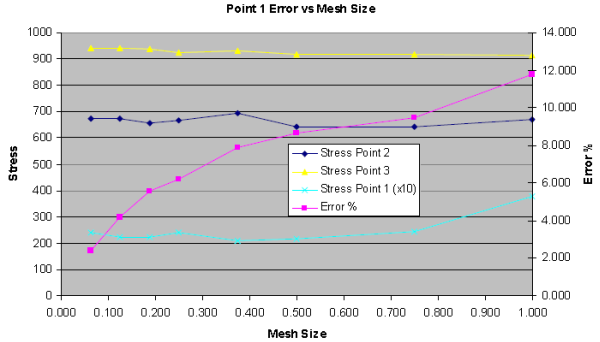 The overall stress pattern for the 1/8″ mesh size – Tresca stress intensity (P1-P3). Close up stress plot of the 3 nodes of interest. The Tresca stresses at the test locations: 1 – 22.2 psi, 2 – 674.7 psi, 3 – 941.0 psi. How accurate are these stress values? Stress results and stress results graph. 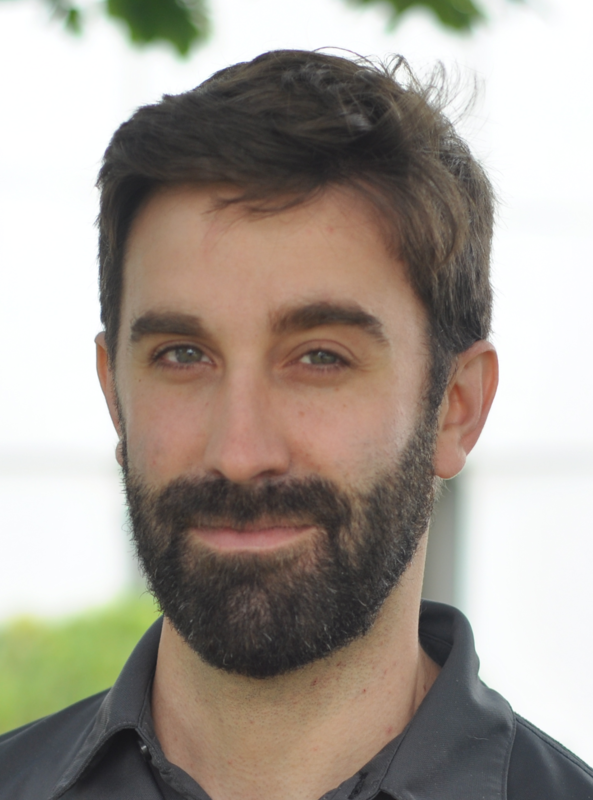 For this study, the results from 0.125 and 0.063″ mesh size meet the 5% acceptance criteria. An ultimate stress value is extrapolated using linear regression on the above stresses and extrapolating to a theoretical zero mesh size (the 1″ mesh size data point for stress 1 is ignored). In general, when the reported error is less than the 5% acceptance criteria, the actual error is much less. 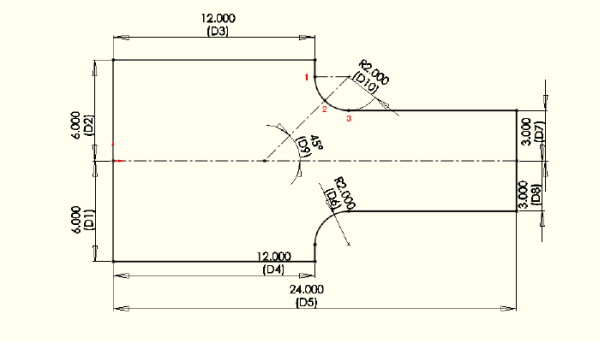 Even when the acceptance criteria is met, some elements will have higher error levels (Point 1 at 0.063″ mesh). 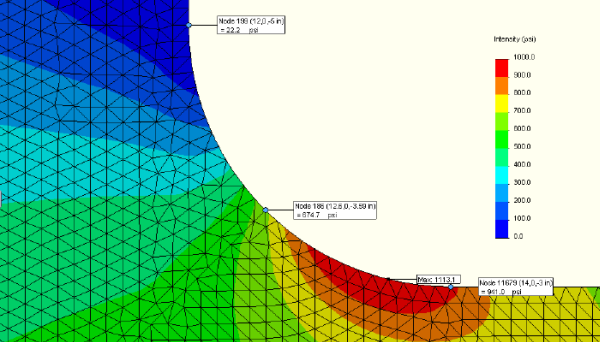 Mesh refinement by measuring the stress at individual locations and extrapolating to a theoretical zero mesh size can be used to validate individual areas on a model. 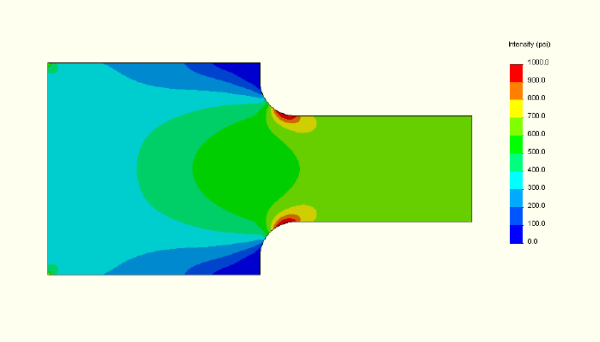 However, many FEA runs are required, and in this case, only 3 points on the model were proven. There is no guarantee that the most important points have been studied. The Error plots prove every element in the model. If the first mesh chosen is acceptable, no additional work is required to prove the model.